Psystar Corporation announced today their OEM Licensing Program. Psystar will begin certifying manufacturer's hardware to allow the licensing of Psystar's new virtualization technology, effectively making their systems Mac OS X compatible. Psystar's virtualization technology, specifically engineered for Snow Leopard, allows for seamless operation of the Mac OS on generic Intel Hardware and would be offered on all Psystar Certified machines. Miami, FL (PRWEB) October 5, 2009 -- Psystar Corporation announced today their OEM Licensing Program. Psystar will begin certifying manufacturer's hardware to allow the licensing of Psystar's new virtualization technology, effectively making their systems Mac OS X compatible. Psystar's virtualization technology, specifically engineered for Snow Leopard, allows for seamless operation of the Mac OS on generic Intel Hardware and would be offered on all Psystar Certified machines. In an effort to spread the Snow Leopard experience to an ever-expanding number of people, the licensing initiative will allow manufacturers to have their hardware Psystar Certified and have their computers pre loaded with our unique technology including the Darwin Universal Boot Loader (DUBL). Qualifying products must fall in Desktop, Server or Mobile categories. Once a product is certified, consumers can purchase it off the shelf or through standard channels and when labeled Psystar Certified would allow the installation of Snow Leopard simply by inserting the retail OS X DVD. Psystar's vision of open computing is to provide users with the freedom to choose which OS's they install on their hardware. The Licensing Program will allow computer manufacturers the opportunity to ship the certified systems pre-configured with DUBL and OS of choice including Windows 7, Windows Vista and several flavors of Linux. These systems would also be compatible with Mac OS X Snow Leopard and receive normal software updates through the use of "Safe Update" technology. The customer can install the Mac OS themselves simply by inserting the retail DVD or choose to install several other OS's with no manual boot configuration. DUBL supports up to six different operating systems on a single machine and configures itself *automagicly*. Manufacturers can benefit from this unique licensing opportunity with minimal expense and in several hardware markets. 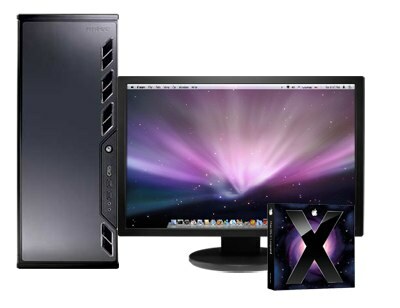 In most cases Psystar will tailor the technology to a specific hardware profile(s) at no additional engineering cost, allowing manufacturers to save time and money by utilizing our familiarity running the Mac OS X on generic hardware. If you are interested in participating in the Licensing Program, head over to Psystar.com or send an email to Licensing@psystar.com. OS X, OS X Snow Leopard, Snow Leopard and Macintosh are products and trademarks of Apple, Inc. Psystar purchases copies of these operating systems to resell as part of its Open Computer systems. Psystar has no other affiliations with Apple, Inc.